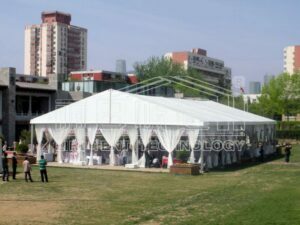 Here only show partial of our marquees for wedding,we can also make customized tent exactly according to your requirement. If you are interested, please contact to get our brochure. LIRI offers high quality marquees for wedding which guarantee you a nice wedding party! Our wedding marquees offer protection against wind and rain also on large areas. The side walls and roofs of the marquees have already proven to be a very efficient advertisement medium also. Your logo can be printted on any where you like on the marquee. Our wedding marquees can provid spacious room for various kinds of events.